Rocky II is a 1979 American film that is the sequel to Rocky, a motion picture in which an unknown boxer had been given a chance to go the distance with the World Heavyweight Champion. Sylvester Stallone, Carl Weathers, Tony Burton, Burgess Meredith, Burt Young and Talia Shire reprised their original roles. 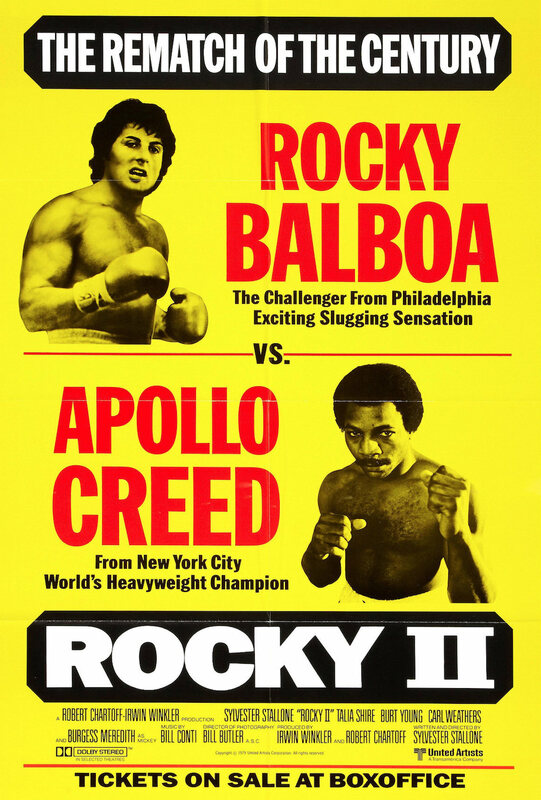 Although this film was released in 1979, the ring announcers say that it takes place ten months after Rocky’s first fight with Apollo Creed, putting the Rocky II fight with Apollo in November 1976. In the aftermath of his celebrated match with World Heavyweight Champion Apollo Creed, Rocky Balboa enjoys his success, and the money he earned from the match (Which Apollo won by split decision and therefore retained the heavyweight championship). He marries his fiancée Adrian, buys her an expensive fox fur, a sports car for himself, and a large new home. When a projected stint in TV commercials fails because he is unable to remember his lines and cannot read the ‘dummy boards’, an embarrassed Rocky is forced to work for the meat packing company alongside Adrian’s brother Paulie. When Rocky later gets laid off from the meat packing company, Adrian, who is now pregnant, tries to support them by continuing to work in the pet shop. Rocky believes he has no future as a boxer and accepts a menial job at the gym run by his former trainer Mickey. Apollo, angered by repeated taunts that his fight with Rocky was fixed, is eager for a high-profile rematch with Rocky to prove that the match was a fluke. Adrian is against it, and doctors have warned Rocky that with his injured eye, another fight could seriously damage his eyesight. With the family resources declining and his pride wounded, Rocky decides that fighting is all he knows how to do, and he makes the decision to get back in the ring with Apollo. Adrian’s lack of support affects Rocky’s training, much to Mickey’s dismay. When Adrian lapses into a coma after giving birth to a baby boy named Rocky Balboa Jr, Rocky stops training. After Adrian later emerges from the coma and tells Rocky to beat Apollo, Rocky resumes his training. Adrian’s love for Rocky is selfless, and Rocky, who feels the same way, is determined to win the title from Apollo this time.